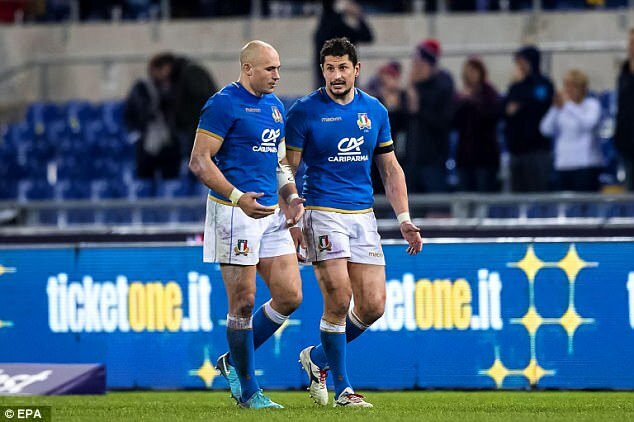 Sergio Parisse has hailed head coach Conor O’Shea for handing him a new lease of life to keep extending his record-breaking Italy career. Captain and talisman Parisse admitted he could easily have quit Test rugby when Jacques Brunel stepped down from the Azzurri helm in 2016. But the accomplished 34-year-old number eight believes former Ireland full-back O’Shea refreshed his lust for the Test game – even before he took charge of Italy. O’Shea swapped Harlequins for Italy in the summer of 2016, and will now coach the Azzurri in Dublin against Ireland for the first time, in Saturday’s NatWest 6 Nations showdown at the Aviva Stadium. Asked if he could possibly have quit Test rugby when Brunel left the Italy post, Parisse replied: ‘Yeah of course, I met Conor in Paris before he took the job. ‘And we spoke a lot, and of course personally sometimes when I talk with someone you can feel quickly if it’s someone who wants to come just for a job and do nothing, or if it’s someone who will come and has ambition. ‘Conor showed straight away he had that vision and ambition, he’s a young coach, doing a great job. ‘Because he’s smart and intelligent, he talked so well and was really confident he could do something to change Italian rugby. ‘I really loved that. He gave me an extra motivation as well to continue to play with the Italian team. Parisse will extend his record as Italy’s most-capped player with his 128th Test appearance for the Azzurri in Dublin this weekend. The Stade Francais back-row forward continues to stand alongside the giants of the modern game, even if his fine career is clearly inching towards its inevitable close. The skillful loose-forward believes Italy are desperate to conjure a top-drawer performance in Dublin, to repay the hard work of ex-Harlequins boss O’Shea, who won 35 Ireland caps between 1993 and 2000. ‘I don’t think the team is more motivated because we’re playing Ireland and because of Conor, but of course for him it’s special to come here, to coach the team at the Aviva Stadium,’ said Parisse. ‘But I think Conor prepared the week with the same spirit and emotion as the last game against England. ‘I think Conor as well, he doesn’t care if we’re playing Ireland – he just wants to see the team perform well, a team that believes as we do in the system and the way we’re working. ‘Every time he asks us to give everything and to think of the performance, and he takes full responsibility for that.